Baby, it’s cold outside! 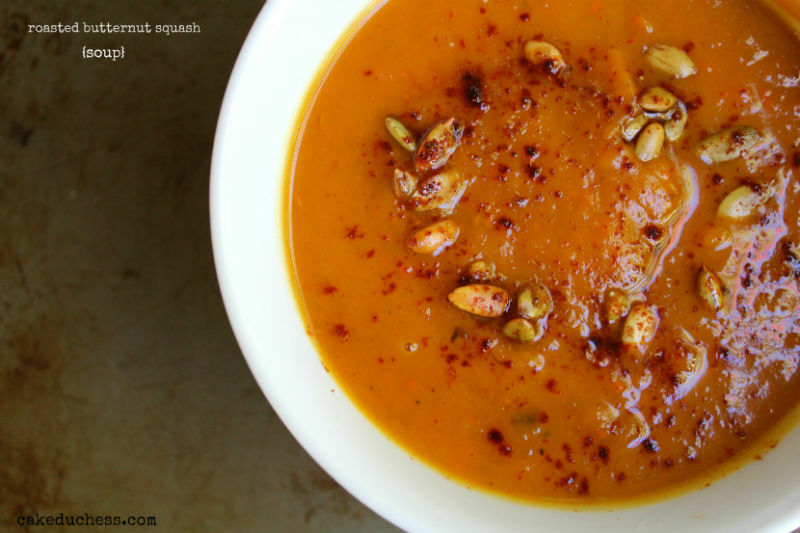 Let’s eat soup…roasted butternut squash soup, to be exact! So it finally happened! The temperatures dropped. There is a front coming all the down to us in Florida and it is refreshing. I’m not saying that we have turned our air conditioning off, but I did open a couple of windows. Every time my mother-in-law visits from Italy, she opens every single window every single day to “air out the place”. No matter how many times she’s visited us, she still hasn’t realized that the temperature is exactly the same in the morning as it was the night before. Meaning that the it is hot and it is humid and if you open every single window you’re only letting in thick and sticky hot Florida air. But she feels it changes the air and it’s better for us and we can breath better. She does this window thing while all the top sheets are pulled completely to the end of every bed. This is so the sheets and beds will be refreshed with that same thick and sticky hot Florida air. And now I do the same thing. Mostly every day of the year, I open every window to air things out. Not matter how hot and sticky it is. I also love to make soup, no matter how hot it is. How do you make roasted butternut squash soup? To make roasted winter squash: Heat oven to 375 degrees F.
Roast vegetables until they are soft. To make soup: Heat the olive oil in a large saucepan over medium heat until hot. Sautee’ the onion, garlic until soft. Add the roasted squash and vegetables. Add the spices and broth. Simmer until ready. What spices go with butternut squash? 1. Cumin, chili powder, thyme, paprika. What’s with the yellow frangipane flower? I grew it! Yep. I have a green thumb. It took about 2 years to bloom. Who knew I had a green thumb!?! Do you know how sweet it smelled? like the most amazing and expensive bottle of perfume made with frangipane flower essence. That’s how amazing. This soup is so easy to make. My neighbor’s daughter keeps asking about it. She said it was so delicious and that she could eat a bowl every night. Funny, so could I! It has such a burst of fall flavors in every single bite. The smell of the vegetables roasting was magical. The smell of rosemary and the sweetness of the squash and potatoes was delightful. Just be super careful when you puree your veggies-they are hot…REALLY hot. If you use your immersion blender, do not lift it up and out above the soup. Keep it in the pot and keep it low and move it around in circular motion. If you lift it a little up, it will splatter hot, hot soup. That’s just a little warning. I’m not saying it happened to me. I’m not saying I was cleaning butternut squash off my walls, arms and glasses. It may have happened. Ok, it happened. Sheesh-that’s embarrassing. Since it’s made with vegetables and vegetable broth, it is vegan. If you prefer chicken broth, go ahead and use it instead of vegetable broth. Preheat the oven to 375 F. Line a baking sheet with a generous amount of foil. Add the butternut squash and sweet potatoes. Drizzle on the olive oil and on the potatoes, mix it around with your hands to incorporate the oil. Sprinkle salt and pepper to taste; toss on the rosemary sprigs. Cover the pan with foil and fold the sheets under. Bake the vegetables in this foil pouch for about 45 minutes until the they are tender. Heat a large pot over medium heat, add 2 Tablespoons of olive oil, the onion, garlic, and sugar and caramelize. When veggies are roasted, scoop the roasted butternut squash out of its shells and add them,along with the sweet potatoes and carrot, to the pot with the caramelized onions. Add the spices and salt and pepper to taste. Add the broth and simmer for about 30 minutes. Puree until smooth; if texture is too thick, add a bit of water (you can puree in a blender or with an immersion blender). Adjust seasoning to your taste. Sprinkle on some pepitas and a little extra spice. I have chicken noodle soup on the menu tonight, but I kind of wish it was this instead. I can never get enough pumpkin – both sweet and savory. This soup looks delicious. Your mother-in-law sounds delightful. I go crazy if I can't get some fresh air, although I do believe that my dislike of the extreme humidity in Florida trumps my love of fresh air…in this case. I love it when it gets cold because we can eat soup!!! This one looks fabulous .. yummm!! and love the yellow frangipane flower. . so pretty!! 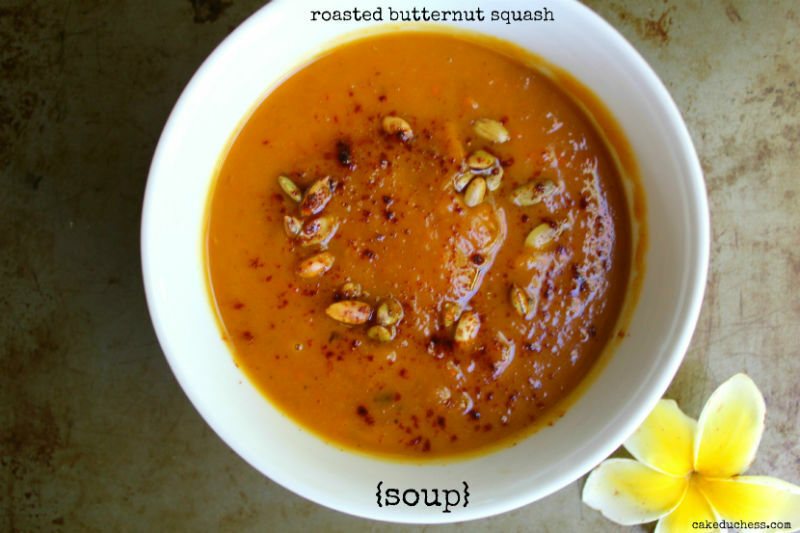 I love butternut squash, such a wonderful fall soup! Count me among the soup lovers of this world, no matter what time of year. I could eat soup every day and if it weren't for my 17-year-old, who isn't that fond of it, I probably would. 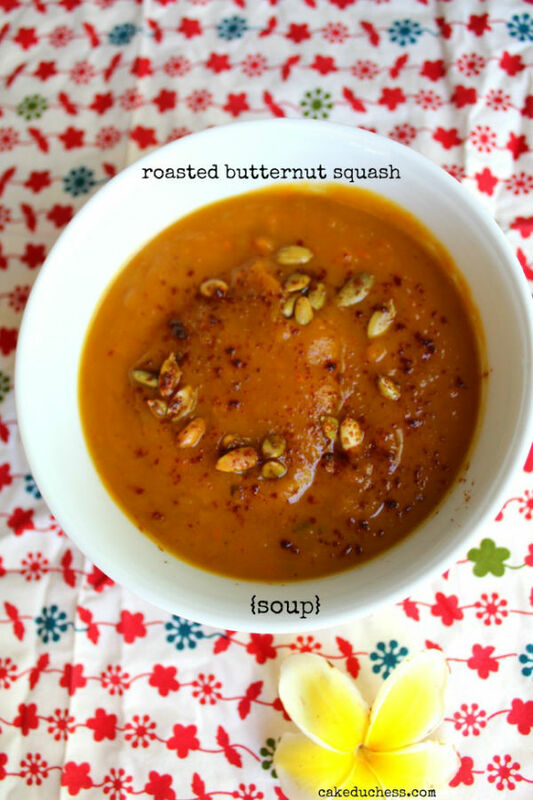 My favorite soup squashes are buttercup and kabocha, with butternut close behind. My current favorite iteration is roasted squash and fennel soup. Your MIL reminds me of my Zia Gilda, who always used to open everything up in the morning as she went about her daily cleaning rituals. Pretty pics. BTW, is that frangipane flower edible? Lol, ugh, I hate when I do something silly and whatever I'm preparing ends up splashed everywhere. I hate it so much that even when I watch commercials for cleaners or paper towels, I cringe when a mess is made. I'm just a little OCD. I love this soup, Lora. It's gorgeous! It's high time I got myself an immersion blender so that I can make this myself. Mmmm.. I'm loving the spices in this soup, Lora! Pinned! Hey! Guess what? Your blog is finally in my Bloglovin' feed. (Yay!) Beautiful yellow frangipane flower, Lora. 🙂 Wish I could take in the fragrance. We need Smell-O-Vision, don't we? Your butternut squash soup looks fabulous! I just adore butternut squash soup and it just isn't Thanksgiving unless I make mine. I love making it the day prior and I, too, like using vegetable broth. For this soup, it just makes sense as it enhances the veggie flavor. Cannot wait to try your roasted version and will be pinning it tonight. Have a wonderful Sunday and enjoy the cooler weather! It IS cold outside and I would love a bowl of this soup. In my opinion, one pot meals are the best part of fall. Hi–looks great.a.. you mentioned the smell of rosemary..yet I don't see it in the recipe? Am I missing something? Just got home from store to make this & now I'm concerned I may have missed something? Okay thanks… you may want to revise your recipe..at the top of it it says 4 Tablespoons (blank)..I assume that's where the rosemary goes? Anyway, my carrot & sweet potato has already roasted but my butternut squash still has a bit to go, so I'll sneak some in. Thanks.. it smells DELISH!! can't wait to try it tonight! That was the olive oil and it was always there on top-not sure why it went away but back again:) My butternut squash roasted quicker than my other veggies. After chatting with you about the soup I'm craving it again tonight!